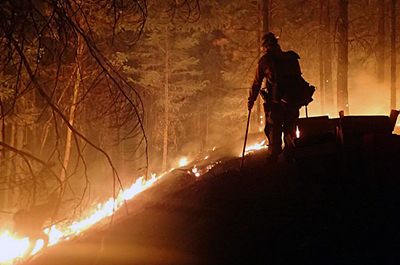 As wildfires are roaring across the West Coast, the need for connectivity amongst first responders is more crucial than ever. When the ongoing Miles Fire forced the residents and community of Prospect, OR, to evacuate, the Fire Incident Management Team called in FirstNet for support. A Satellite Cell on Light Truck (SatCOLT) is deployed at base camp where nearly 2,000 first responders gather to coordinate their response efforts as the wildfire has grown over the past month. Deployable equipment, like SatCOLTs, give public safety access to a connection and additional capacity during prolonged response to natural disasters or in remote areas where additional coverage is need. The additional capacity is also important when large numbers of public safety personnel are called in to help with a response. FirstNet also supports responders with the devices they need for enhanced situational awareness and coordination during wildfires. For example, when severe wildland fires tore through the Napa Valley and Sonoma region of California in October 2017, some firefighters experienced challenges with their communications. Now, California is once again confronted with massive wildfires that have taken lives and property. Our network partner, AT&T, has deployed network assets to several sites in the State to help public safety and the communities they serve communicate and coordinate to fight these fires. There are not enough words to thank the first responders battling these relentless wildfires. Day in, day out—they put themselves in harm’s way to protect their community. FirstNet is public safety’s network – built for them, by them to meet their lifesaving needs. We are proud to serve them. My thoughts are with the communities and first responders in my home state of California and all those facing ongoing fires along the West Coast. To all my fire service colleagues—keep safe. Kevin Nida is the First Responder Network Authority Senior Public Safety Advisor for California. He has served in fire, EMS, law enforcement, 911 and the private technology sector for 40 years. Nida was involved in radio interoperability, an early builder BTOP project and many other public safety based projects in the Los Angeles area. He retired as a fire battalion chief for the Los Angeles Fire Department. For more information about the First Responder Network Authority, visit www.firstnet.gov.